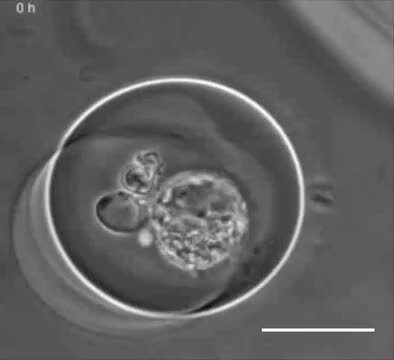 Growth of an MCF10DCIS.com cyst inside an alginate gel capsule. Time-lapse, phase-contrast imaging shows the oscillations of the cyst before reaching the walls of the capsule. Images were recorded every 5 min. Scale bar: 100μm.